There are holidays all throughout the year, which means there are several opportunities for new crafts each month. 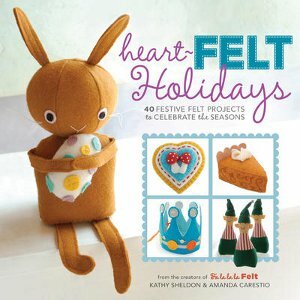 If you like the make holiday-themed projects that are inexpensive, but still professional-looking, then you’ll want to hear more about Heart Felt Holidays, one of the best books out there for sewists this year. This book includes 40 custom designs that all utilize the versatility of felt in making decorations for all occasions. Not only will you have a great guide to assist you in picking projects perfect for an upcoming holiday, but you’ll also have a resource for different sewing techniques and materials to ensure that every craft you make is of the best quality. Even just from looking at the cover, one can see how different each one of these projects is from one another. This means you’ll be able to have a range of new decorations for your next set of holiday decorations. You may even find some of these adorable projects to be perfect as gifts. Heart Felt Holidays includes full color pictures and detailed step by step instructions, so if you find a project that you just have to make, you won’t have to worry about getting lost without details. With so many holidays coming up, you’ll want to get your hands on a copy of Heart Felt Holidays as soon as possible, which means you should enter the newest giveaway from AllFreeChristmasCrafts. We’re giving away one copy of Heart Felt Holidays, and you have until the 29th to enter. Find out more on our page and enter to win today!